In the Mid-Atlantic region goin’downeyocean is a way of life, whether it is in the spring and summer or the dead of winter; a trip to the beach is always a welcome experience. Sooner or later the beach goers will drive along Coastal Highway. Annually, thousands upon thousands of cars, vans and suvs drive blissfully past several imposing monuments without blinking an eyelash. Okay, the cars wouldn't blink, but the folks inside would. So, what exactly, would they miss? In Delaware alone there are thirteen reinforced, concrete, cylindrical sentinels seventy-five feet tall looking for all the world like something left over from a set from filming of Star Wars or The Lord of the Rings. They are Beach Watchtowers, leftover from a war but it wasn’t a fantasy war, it was real. It was World War Two. During World War II the towers monitored the busy shipping lanes by the Delaware Bay on the alert for enemy vessels, especially submarines. Working in pairs, the Towers would triangulate the position of an enemy vessel and transmit the exact location to the shore batteries that would destroy the enemy vessel with artillery fire. During the Cold War they were used for classified missions. While these towers might appear to be abandoned and forgotten that wouldn't be quite true. One, Tower 7, at Fort Miles, has been renovated and is open to the public. Fort Miles, the grounds of which are now Cape Henlopen State Park, Lewes, DE, was home of the “Big Guns”. Artillery designed to protect the entrance of Delaware Bay from enemy ships during the height of World War II. It was the largest and most heavily armed coastal defense fortification ever built in the United States. three batteries at the Cape May Military Reservation in New Jersey. The first was Battery 25 with four 155 mm (6.1 in) guns. Battery 223, a 6-inch (152 mm) battery, similar to Batteries 221 and 222 at Fort Miles. Additionally, a large mine field was laid in the waters off Lewes, Delaware. While Fort Miles never saw any major action during World War II, it routinely fired its guns in practice and achieved high marksmanship ratings. While they never used those guns to engage an enemy, they’re moment of glory came when it received the surrender of U-858, a German U-boat that was part of Wolfpack at the time of the German surrender to Allied forces in Europe. In addition to the shipping lanes there was much in and around the Delaware Bay that was essential to protect. Among them being chemical plants, oil refineries and the Naval Shipyard, not to mention the major cities of Philadelphia and Wilmington. As for the remaining Fire Control Towers; Tower 9 was completely renovated in 1986 and serves the Delaware Pilots Association. It is also known as the Pilot Radio Tower. It controls radar and communications for all incoming and outgoing commercial shipping in the Delaware Bay Estuary. There is a civilian restoration campaign under the auspices of The Delaware Seashore Preservation Foundation and the Fort Miles Historical Association to restore all of the Fire Control Towers to their original condition. Fire Control Tower #3, in Dewey Beach, has been partially restored and each evening it thrills passers-by as it is bathed in dynamic blue light. Tower #7 in Cape Henlopen State Park stands 75 feet tall and if you climb all the way to the top you can see 14.5 miles in any direction. Fundraising for Tower #1 in Fenwick and Tower #2 in North Bethany is currently underway. It is hoped that some restoration work can be started soon. 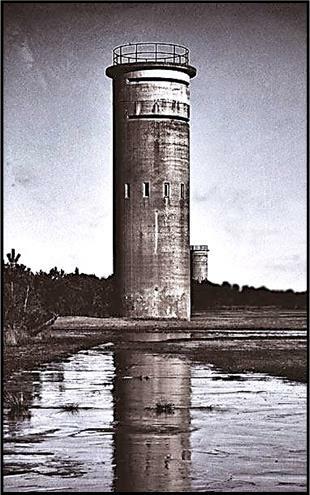 Fire control towers were erected along the Atlantic coast from New England to Virginia with several at the mouth of the Chesapeake Bay at Hampton Roads Virginia. However, these have been decommissioned and disassembled.